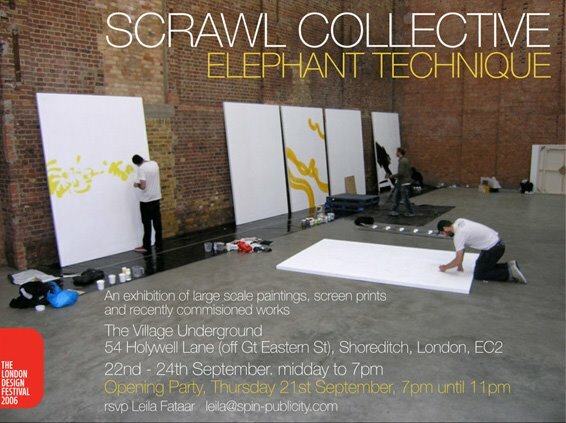 Last night saw the opening of a new Scrawl Collective exhibition as part of the London Design Festival called Elephant Technique. The new show is being hosted in a magnificent new event space in London’s Shoreditch called the Village Underground. Large Scale paintings by Danny Sangra, Distone, Mr Jago, Will Barras, Steff Plaetz and Phlash plus a rare chance to see their complete series of screen prints all under one roof. The show runs from 12.00pm - 7pm, Fri 22nd - Sun 24th 2006. Only just heard about this, shame Im going to miss it :s.